Is there anything that feels better than a good back rub? Maybe a few things, but not many. Back rubs feel so good because our backs are put through a lot every day. We’re constantly walking on hard surfaces, which constantly jostle the entire skeletal system. Few chairs are properly designed in order to improve conditions for the back, and even those chairs that are well designed are worthless because we fail to sit in them properly. Of course, many of us sit slouched at our desks all day and then go home to a couch that doesn’t give the support it could. Is it any wonder that so many of us are suffering from lower back pain? Of course, age often plays a significant role for many people. How many old people do you know who don’t complain about their back? 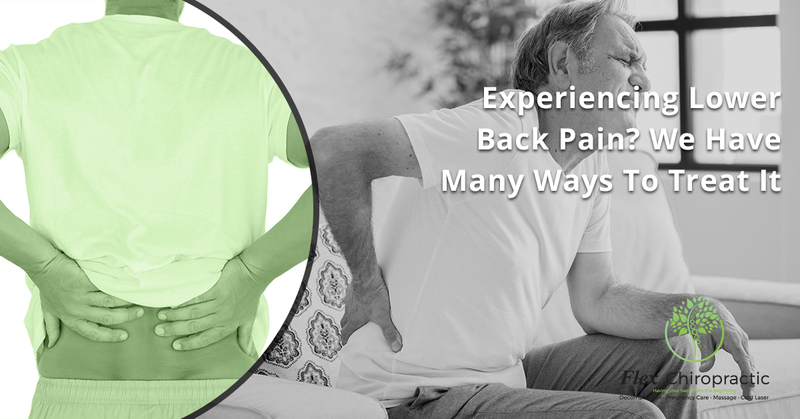 But more and more people under the age of 40 are experiencing back problems, often because they aren’t prepared for the work or play they are attempting to perform. In the past, those who performed manual labor all day wouldn’t have any problem lifting a 40-pound bag of dog food. Today, most people are more likely to hurt their backs because they don’t have the back muscle strength the support their spine during lifting. No matter your back problems, the chiropractors and technicians at our chiropractic care clinic can offer treatments to reduce your pain or discomfort. Let’s find out how. Chiropractic’s primary method of helping the body is through spinal manipulation. When the spine is hurt, there is often inflammation that needs to be reduced in order to reduce swelling and pain in the back. Adjusting the spine is often one of the first treatments offered for lower back pain; reducing stress on the spine can help alleviate the pressure on the discs. Adjustments aren’t the only weapon in our arsenal fighting spinal pain. Ultrasound therapy and cold laser therapy are sometimes used in order to increase blood flow to the area of the spine in question. More blood flow means more oxygen and faster healing. If you have the choice between hurting a muscle or the discs of the spine, pick the muscle. A damaged disc tends to be weaker for the rest of your life, while muscle pain tends to go away over time. That doesn’t mean that you shouldn’t seek help, though. Like ultrasound and laser therapy, massage stimulates blood flow to the muscles, meaning that they heal faster. Tight muscles can also be “loosened up,” helping patients to regain extended movement. Of course, the feel-good benefits from a massage can’t go underestimated. The brain releases endorphins because massages simply feel good, and the same happens due to the human contact received. Our chiropractic clinic is here to help with your lower back pain. We can determine if your problem is spinal or muscular, and we’ll provide the right treatments that help you feel better. Visit our Columbia or Lexington offices today!